We are planning to make a weekend of it and hope that you will join us on the Friday and Sunday also for more food and drinks! In fact, we shall be there from the Wednesday to Monday if you want to have an even longer holiday! Please use the form below to RSVP your attendance. There is lots of accommodation not far from the Chateau in the surrounding area and you can obviously choose where you want to stay. However, if you do not want to spend hours researching available accommodation, we have also reserved available rooms at the accommodation closest to the Chateau (which also has excellent reviews on tripadvisor and booking.com). This is a 16th century manor house in Terce which has hotel rooms and cottages. There is also a spa and outdoor swimming pool and lots of outside space. The Normandoux is around a 5 to 10 minute drive from the Chateau where the wedding will be held. The above prices do not include breakfast. Should you want to camp, we can have up to 3 tents at the Chateau for which there will be no charge. You will be able to use the bathrooms and toilet facilities in the Chateau if you camp. Should you wish to stay elsewhere, there is lots of other accommodation also available in the area. However, if you want to stay at Manoir de Normandoux, please let us know asap. 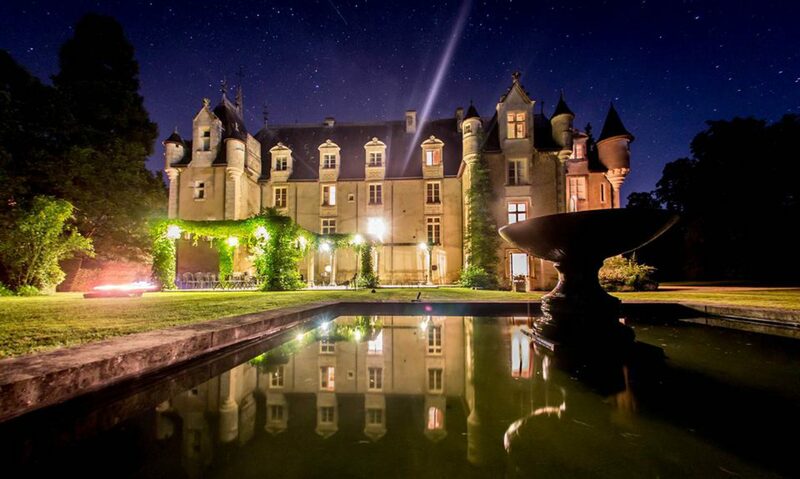 The Chateau, and the accommodation we have reserved, can be reached by plane, train or car. The nearest train station and airport are both in Poitiers which is only about 15km away and takes about 20 minutes by car. Tours and La Rochelle airports are also not that far away. If you want to explore the area more, then car hire is available at the airport. Please do let us know when you have booked your travel, because we can then look into arranging travel to and/or from Poitiers (if lots of you arrive/leave at the same time) or help to put you in touch with others making the journey at the same time as you. The Chateau and accommodation is within easy reach of a number of airports. Poitiers is the closest airport and is only about 15km away. Ryanair has flights around 4 times a week between London Stansted and Poitiers. The flight takes around 1.5 hours. Wednesday 22 June from Stansted at 14:05 (UK time), arriving at 16:35 (French time). Friday 24 June from Stansted at 14:05 (UK time), arriving at 16:35 (French time). Sunday 26 June at 17:00 (French time) arriving back in the UK at 17:35 (UK time). As there is only one flight a day to Poitiers at the above times, we would recommend you book early to ensure you get a seat and at the cheapest price. If lots of people end up booking on the same outbound/return flight from Poitiers we will try to arrange transport to collect you all. The airport at Tours is just under 1.5 hours away by car. Ryanair have flights to Tours which take around 1 hour 20 mins. The airport at La Rochelle is just under 2 hours away from the Chateau by car. The flight takes around 1.5 hours. Both Ryanair and Easyjet fly to La Rochelle. Nantes, Limoges and Bordeaux are also within a few hours drive. You can also travel to Poitiers by train direct from both Paris Montparnasse and Paris Charles de Gaulle airport. There are also indirect train journeys that take slightly longer. The direct trains from Paris Montparnasse to Poitiers appear to be roughly every hour and takes around 1 hour 40 minutes on average. From Charles de Gaulle the direct trains appear to be every couple of hours and take 2.5 hours on average. When we checked last, it was too far in advance to book tickets from Paris to Poitiers. As you already know, you can get trains on the Eurostar from London Kings Cross to Paris and these run really regularly and usually take under 2.5 hours. As a rough guide, according to Google.maps it takes between 8 hours to 10 hours (including time spent on the Channel Tunnel) to drive from North London to the Chateau. We shall be arranging a casual meal (barbecue/buffet etc.) and drinks for the Friday evening at the Chateau and you are welcome to join us for that. We expect this to cost around £15 per person. The ceremony and reception are both to take place at the Chateau. Exact timings yet to be confirmed, but we expect to hold the ceremony at around 2.30 pm. Weather permitting we hope to have the ceremony outside in the Chateau’s grounds. The ceremony will be followed by a drinks reception then wedding breakfast. Further details about the menu are to follow, though please do let us know if you have any specific dietary requirements. There will be drinking and partying into the night also at the Chateau. As most of you will know already, we are not really morning people at the best of times. Therefore, do not expect us to be up too bright and early the following day! However, we do intend to have a casual lunch (barbecue/buffet etc.) on the Sunday at the Chateau which we hope you will be able to join us for. Again we expect this to cost around £15 per person.